Gold stocks had a huge run in 2016, and then lost steam. What does that mean for 2017? If you invest in gold miners, you know their stocks react swiftly to the often violent swings in the value of gold. You can't control that any more than can the management teams of giant global gold miners like Barrick Gold (NYSE:GOLD) and Newmont Mining (NYSE:NEM). That's why you want to watch gold prices, but focus more attention on how well your gold stocks live up to the projections made by management. Here are two key factors you'll want to track in 2017. Gold is a commodity traded based on supply and demand, with a fair amount of emotion thrown in the mix since the precious metal is seen as a store of wealth. In other words, it can go up and down for no other reason than investors are pessimistic or optimistic. That was on full display in 2016, when gold turned higher early on, peaked, and then began to move lower again. It took a notable dip after the election of Donald Trump as the next U.S. president. The difference? Investors' moods shifted from fearing economic weakness to expecting economic growth. The impact? Gold started the year at around $1,060 an ounce, reached $1,370 in August, and ended the year around $1,140 an ounce. That had a huge impact on mining stocks. Just take a look at the price chart below showing industry giants Barrick and Newmont for evidence of the impact. The thing is, miners can't control the price of gold. So, they focus most of their energy on other things. And that's where investors need to pay the closest attention. For example, costs are increasingly important in the gold sector. Part of that is simply math; the lower your costs, the more you make from selling an ounce of gold. Costs are also important because a company that puts out guidance for falling costs should be held accountable for living up to what it says it will do. The ability to keep costs in check shows financial discipline, something that often gets lost when times are flush. Barrick Gold all in sustaining cost history and projections. Image source: Barrick Gold. On that score, Barrick Gold is projecting all-in sustaining costs, a measure of what it costs to pull an ounce of gold from the ground, of around $700 an ounce by 2019. The miner's all-in sustaining costs were $864 an ounce in 2014. Both of those are actually pretty decent numbers, but if Barrick can keep to the path it's laying out, it will be in a far better position to deal with shifting gold prices. Newmont, for comparison, has taken its all-in sustaining costs from $1,170 an ounce in 2012 to around $910 in 2016. Another big issue, though, is depletion. Every ounce of gold that comes out of a mine reduces the amount that can be mined in the future, so miners are always looking to find more gold. Both Barrick and Newmont have projects in the works that you need to watch. These efforts are important for the duo, ensuring that they replace what they pull out of the ground and maintain low-cost production over time. That said, this pair is currently more focused on ensuring they run the lowest-cost mines, not growing production. 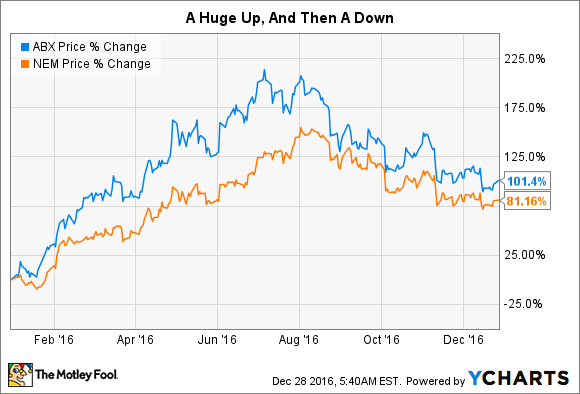 Growth is a much bigger issue for a miner like Eldorado Gold (NYSE:EGO). This miner recently sold assets in China so it can put more money into its growth projects over the next few years. These investments are expected to lower the company's all-in sustaining costs and, more importantly, increase its gold production as much as 110% by 2020. It has more projects lined up after that, too. Investors need to monitor the progress of those plans in 2017, and beyond, to see if Eldorado is living up to its self-imposed targets. At this point, Eldorado's future is tied to the successful execution of that growth vision. Eldorado Gold's investment pipeline. Image source: Eldorado Gold. Investors in the gold industry have to keep an eye on the commodity's price, of course. But that's just one aspect of the gold mining business. In 2017, you'll also want to monitor how well miners like Newmont and Barrick manage their costs. And you'll want to track the progress of new mines and expansions at this pair, and even more so at growth-focused competitors like Eldorado Gold. Overall, often erratic gold prices will push gold mining stock prices around. But the best managements will be the ones that live up to their cost and development projections.